Gregory J. Bozdech 54 of League City, Texas, formally of Norwood, NJ passed away on Thursday, September 6, 2018. Beloved husband of Lori (nee D’Agostaro) and loving father to Joseph Frank. Greg was born on September 11, 1963 to Lillian (nee Stubits) and Joseph C. Bozdech (deceased). Beloved brother to MaryLee and Michael McGoorty, Mark Bozdech, and Jody and Peter Calabrese, Jr. Son-in-law to Lauretta and Frank (deceased) D’Agostaro, and brother-in-law to Louis and Cheryl D’Agostaro. Also, survived by his nieces and nephews, along with many loving relatives and friends. Gregory grew up in Norwood, NJ where he was a parishioner of Immaculate Conception Church and served as an altar boy. Greg attended Immaculate Conception School, where he played basketball and was a Boy Scout. Greg also attended St. Joseph’s Regional High School and later he received a degree in Dairy Husbandry at Delaware Valley College. As a teenager, Greg began his career as a volunteer in the Norwood Ambulance Corp and the Norwood Fire Company #1. Greg also worked at the A&P in both Norwood and RiverVale, NJ. Greg moved to League City, Texas and began to volunteer at the League City Fire Department in 1997. Greg started working for the City of Pearland and in 2007 became the Deputy Fire Marshal. Later that year, he accepted a full time Deputy Marshal position, which he held until his promotion in April 2016 to head Fire Marshal. Greg was instrumental in implementing Pearland’s Accelerant Canine Program and was the handler for the first canine team with his beloved partner, Buddy. 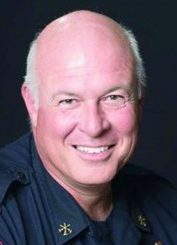 Greg held many advanced certifications as a Structure Firefighter, Fire Inspector, Fire and Arson Investigator, Fire Service Instructor III and Fire Officer II. He was also a licensed Peace Officer and Certified Emergency Medical Technician. All are invited to give thanks with the Bozdech Family for the life well lived of Battalion Chief Fire Marshal Gregory Joseph Bozdech on Saturday, October 13, 2018 at 11:00AM Immaculate Conception Church, Norwood, NJ.